Breakfast on a rooftop with the book for company. In 2007 I was the cataloger in the Arizona’s oldest library, the Copper Queen Library in Bisbee. Then, as now, I kept an eye out for new books that sounded promising and was in the enviable position of having the nearby county library buy almost any I wanted for the collection. 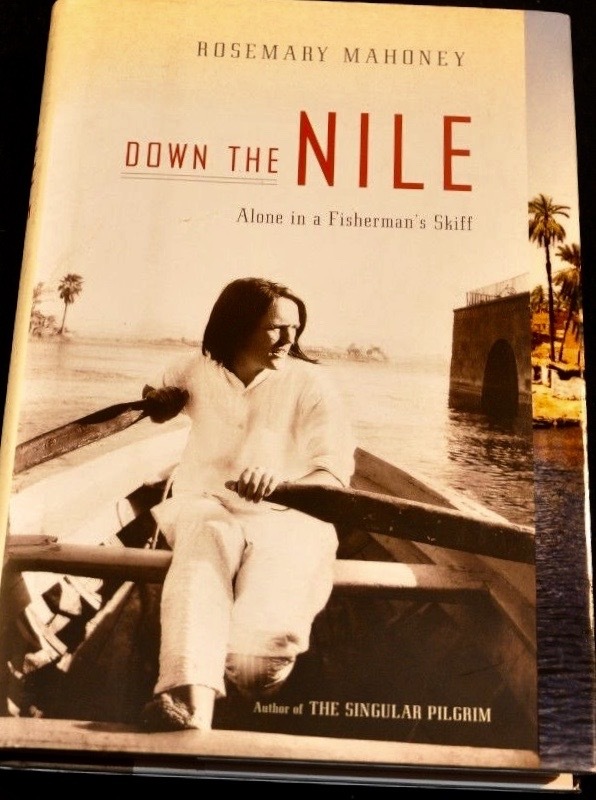 That year I noticed one that sounded particularly interesting, Rosemary Mahoney’s Down the Nile: Alone in a Fisherman’s Skiff. They bought it and I loved it. Then last summer, as I was putting together my trip to Egypt, I remembered it and, though I seldom re-read books, I ordered a used paperback copy to take with me. 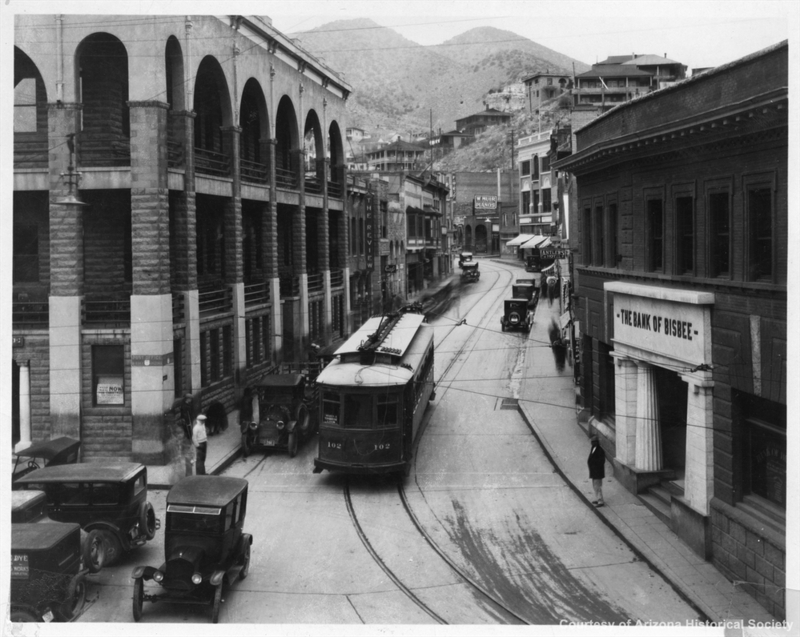 Downtown Bisbee, my library office upper left corner (a bit before my time). After Cairo and Luxor, I arrived in Aswan on a run-of-the-mill river boat and, though there was one night of the cruise package remaining, I was bored with the boat and the food and decided to leave, to go a day early to the hotel I'd booked. Watching rural Egypt go by from my cabin, and the book. 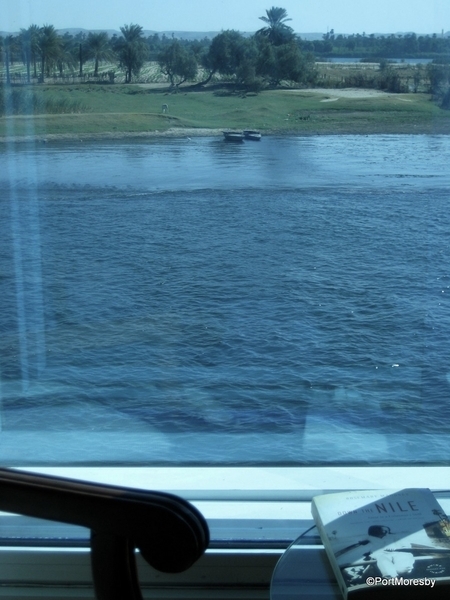 The Philae Hotel, recommended by Lonely Planet, was adequate and the view of the Nile from my room beautiful. But the location, which had seemed an advantage, was on the main road and noisy. 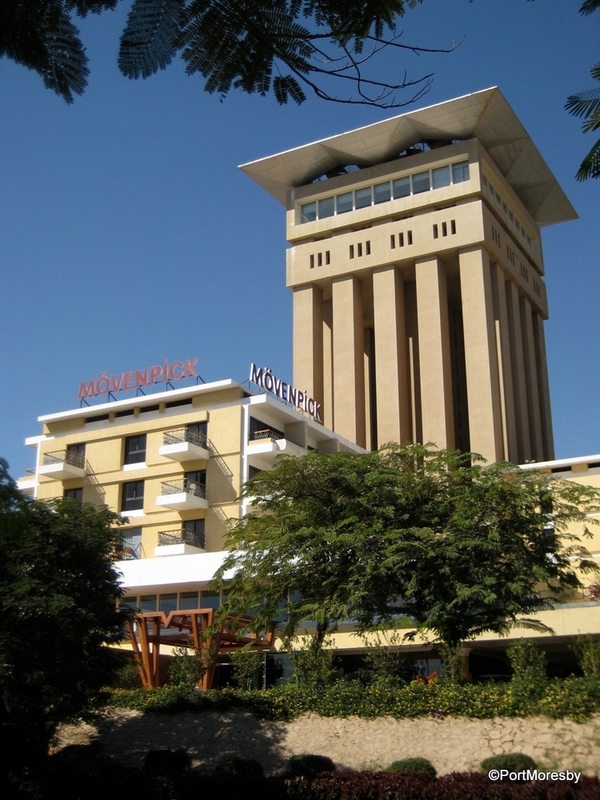 I hunted online for another place and while I felt I couldn't afford the best place in town, the Old Cataract, I would splurge on the second best, the Mövenpick. 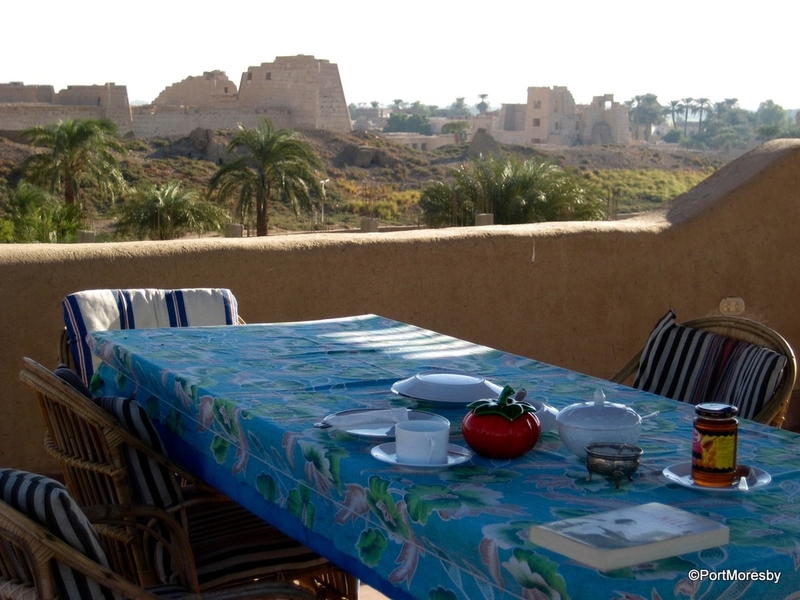 Set in lush gardens on traffic-free Elephantine Island, I could see it from my room. The staff at the Philae were understanding as I apologized for leaving and I felt optimistic walking to the Mövenpick dock to catch their ferry. 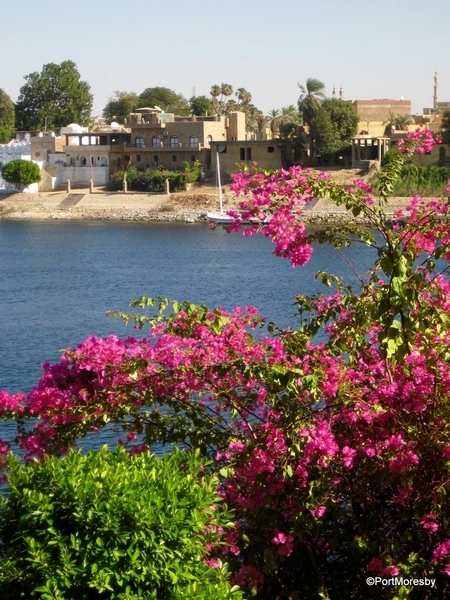 I was given a huge and wonderfully quiet room with a big balcony overlooking the garden and river and the botanic garden on Kitchener’s Island, with feluccas sailing by, the desert on the far bank, thrilling. The ever-changing view from my room. When I went down to the dock to cross again to town, a gentleman was there and he said in a soft voice that if I'd like a sailboat ride, his boat was right there at the dock. He gave me his card, his name was Hamada and every time I came or went he was there and we'd chat for a moment. 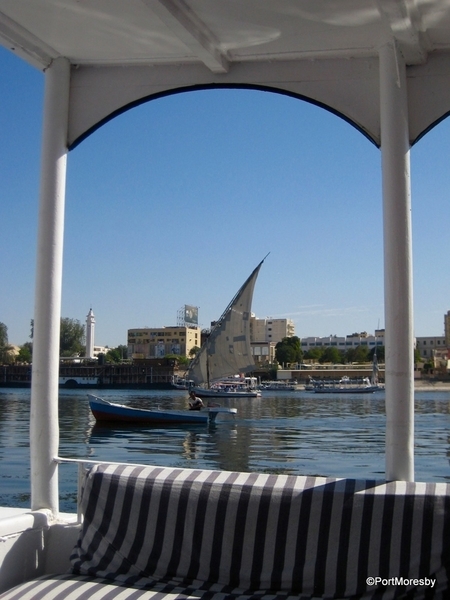 I decided that I would, indeed, have a sail with him, a ride in a felucca a thing one simply should not neglect to do. Meanwhile, I’d been reading Mahoney’s book and it occurred to me that he seemed a great deal like someone in the book both physically, his height and build, and the gentleness of the Nubian man who'd made her journey possible. But I also thought it would just be too much of a coincidence in a town with hundreds of feluccas. On the day I decided was a good one for a boat ride, Hamada wasn’t there when I arrived, so I hired another boat. On the Mövenpick ferry, crossing to town. 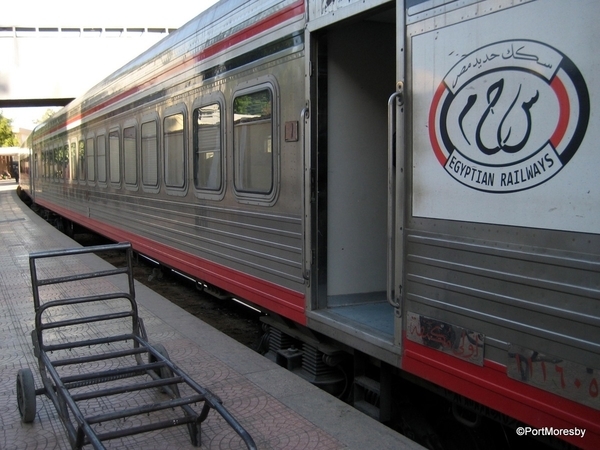 I was leaving next day on the 3:00 train to Luxor. I checked out of the hotel at 1:00 and went down to the ferry. I didn't see Hamada but took a couple of pictures of his boat and for the first time noticed a small rowboat tied to the front. Unusual on the river, a small rowboat had played a pivotal part in Mahoney’s story and to say that I was stunned would be an understatement. 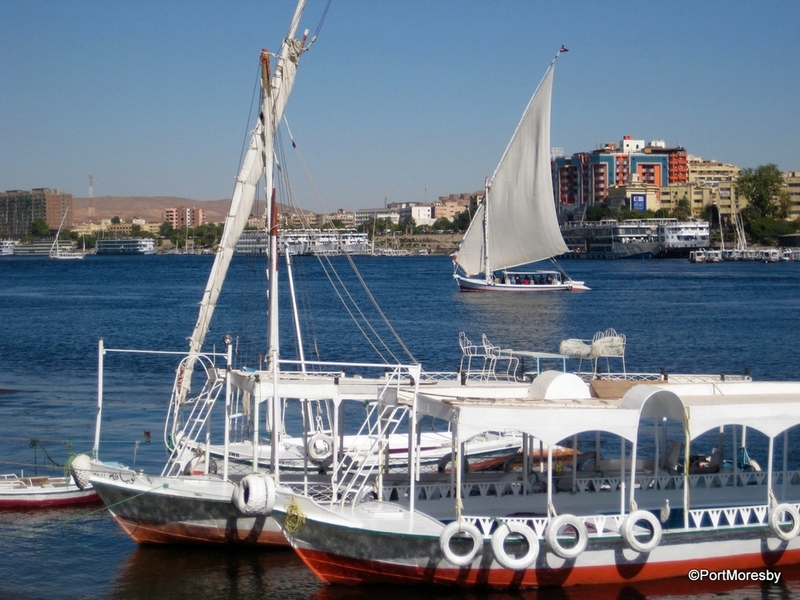 Hamada's felucca & the rowboat. Just at that moment I heard Hamada’s voice behind me. I asked if the rowboat was his. Yes, it was. I had the book in an outside pocket of my pack to read on the train, pulled it out and asked if he was the man in the story. He didn't answer and realizing he may not have known about the book, I explained about the woman who’d borrowed a rowboat from a man in Aswan, and he said it had been his younger brother, Ashraf. I asked if his brother was unmarried and had been building a house on the east bank. He said yes. I asked if he had a sister who'd had operations on her foot. He said yes. He then told me that his brother had never married, never finished his house, and he'd died in 2015 in his felucca called ‘Amazing’. His friends had seen it floating in the river, and going to investigate, had found him. Hamada then asked if I'd like to go to his house and meet his sister, Amel. I asked him about going to the station and he said he'd take me afterward, plenty of time. 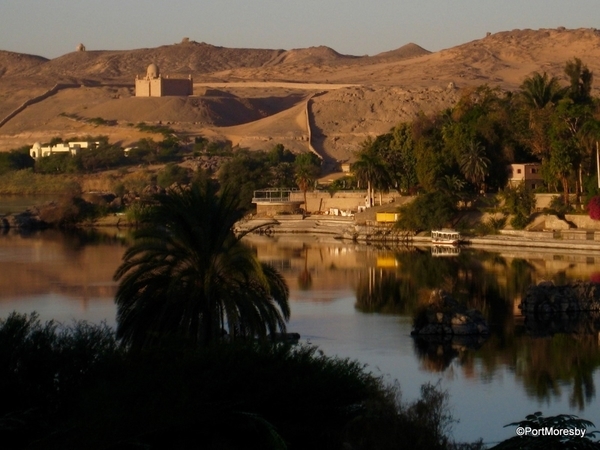 Nubian village on Elephantine island. So we went to his house in his motorboat, in a nearby village on Elephantine Island. His sister was there and we chatted, then we went up on the roof to see the view. When we came down to the kitchen again I saw the tiny room containing the stove where Amel cooks, mentioned in the book, and the larger room open to the sky. His sister made us tea and we talked companionably before going back to the motorboat for the short trip across the river. We walked to the station and sat on a bench until it was time for the train to leave. Hamada keeping me company, the book peeking out of my pack. On my way back to Luxor. From time to time I have coincidental encounters when I travel, but none like this one, the feeling that I’d walked into (or out of) the pages of a book, that the setting and characters of the story were waiting for me in a place I’d dreamed so long of going. While I can offer no guarantees for future readers, one never knows and I do recommend the book. when Down the Nile was published. 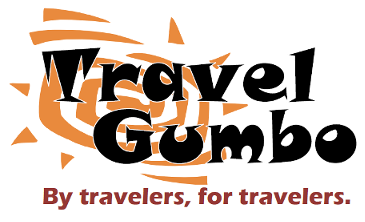 All episodes of 'PortMoresby in Egypt' can be found here. And others of PortMoresby’s contributions here. My guess would be that only about 0.00001% of travelers to Egypt would have a familiarity with that book, interesting though it seems. You may very well have been the first person ever who recognized Hamada from Mahoney's book. 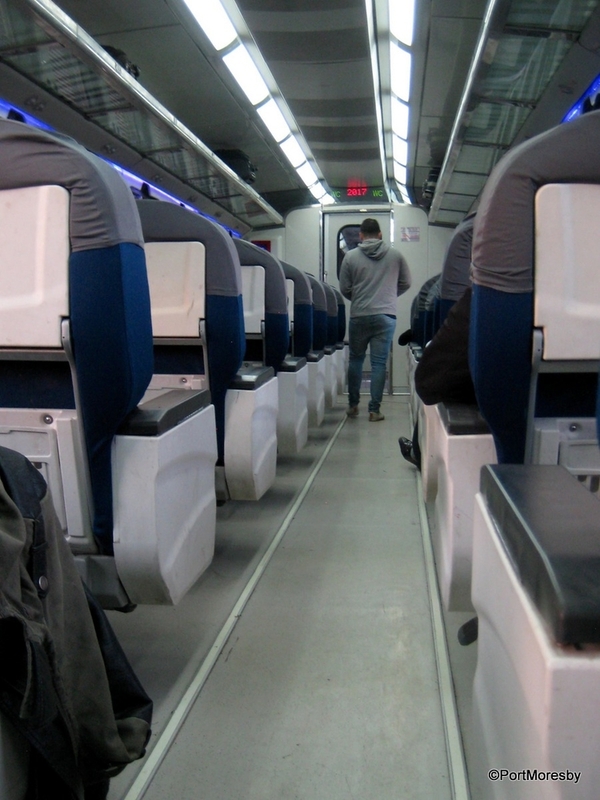 But a charming tale it is and one that turns a good trip into a memorable experience. I'm saddened to hear that your story has you returning to Luxor already. 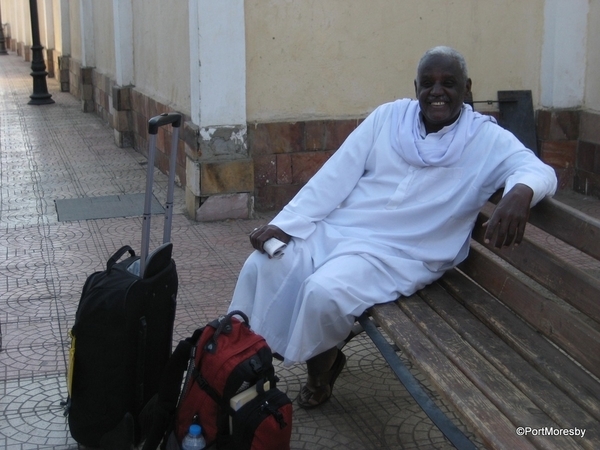 I've enjoyed your Nile journey. I felt the same, DrF., already? And why I can't rid myself of the feeling that I must go back. 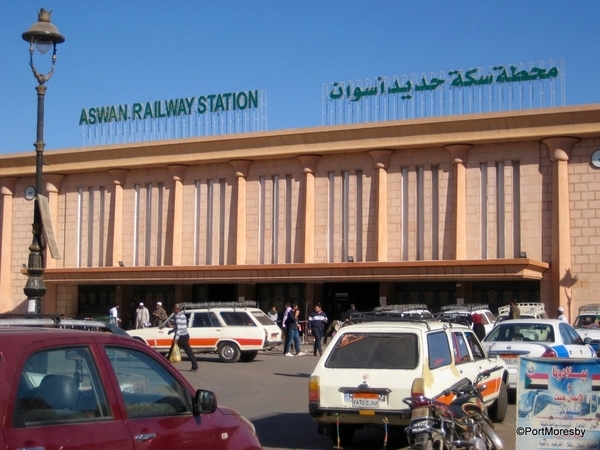 Aswan is the business ! Well when you do, take a look for a family belonging a guy called Fikri on the outskirts of the Nubian village opposite and downstream. Another insight with good people !